A Mozambican army soldier inspects a building destroyed during a night attack by a suspected armed Islamist group in Chicuaia Velha village, Nangade district, on November 23, 2018. Maputo — Residents of Nangade district, in the northern Mozambican province of Cabo Delgado, have taken the law into their own hands, launching a counter-attack against supposed members of the insurgent group that has raided several Nangade villages over the past few weeks, according to a report in Thursday's issue of the independent newsheet "Carta de Mocambique". On Wednesday this improvised Nangade militia captured and beheaded two of the insurgents. They cut off an arm of one of the men and displayed it beside the house of his family in the village of Litingina. They also destroyed 17 houses belonging to people who are supposedly relatives of the insurgents. 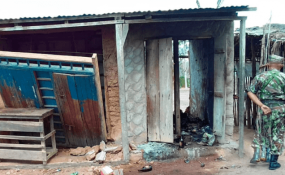 The insurgency in Cabo Delgado began in October 2017 with attacks against police premises in Mocimboa da Praia district. The raids then spread into the neighbouring districts of Palma, Macomia and Nangade. The attackers are believed to be islamic fundamentalists, calling themselves Ahlu Sunna Wa-Jama - but referred to locally as "Al-Shabaab" (although they do not seem to have any direct connection with the Somali terrorist group of that name). The revenge raids seem to have been sparked off by an attack against the village of Lilongo at about 02.00 on Wednesday morning. The islamists destroyed 60 houses in Lilongo, and stole food, clothing and livestock. There was no loss of life, because the residents fled into the bush. But later that morning men from Lilongo, Litingina, Chicuaia, Nkonga and Machava villages, communicating by mobile phone, organised a raiding party that descended on Nangade Lake, where insurgents were believed to have set up a camp. Armed with knives, axes, hoes and similar weapons, the group captured two men believed to be insurgents. Instead of handing them over to the police, they decided to execute them on the spot. They were beheaded, in retaliation against the decapitations carried out by the islamists against many of their victims. Seven other supposed insurgents were spotted fleeing from the scene. "Carta de Mocambique" found that one of those beheaded is named Fazil Chungu. He was a native of Litingina village and is believed to have been involved in the insurgency since it started in 2017. He is said to have acted as a guide for the insurgents in some of their attacks. The newsheet also reported a resumption of attacks in Palma district. Three Palma fishermen reportedly escaped an attack on Tuesday, and on Wednesday insurgents were seen at the Loki and Canambwi fishing centres, but there were no casualties. On Tuesday morning two youths on motor-cycles were ambushed in the Pundanhar administrative post by two men wearing military uniforms and armed with bush knives. One of the youths escaped, but the other was beheaded and his body left by the roadside. Local people later buried him.